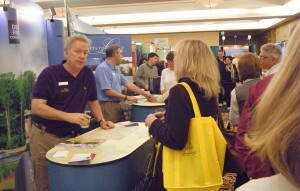 The ideal-LIVING Resort & Retirement Expo is more than just a simple “meet & greet”. This is a perfect opportunity to shop dozens of communities without spending the time or incurring the expense of traveling to each and every one. Instead, in a matter of hours, you can benefit from the insights of all these builders and developers. The Expo is designed to give you a comfortable environment to speak with numerous exhibitors from a variety of locations. The ambiance is one of friendliness, without pressure. Almost all of the exhibitors offer a specially priced Discovery Tour package. No matter how much information you accumulate about a particular community, the fact is, “you won’t know until you go”. These travel specials are priced to make that trip both affordable and delightful. The Expo also offers a number of seminars throughout the day. Topics such as interior decorating (sponsored by Southern Living), cooking to create a healthy lifestyle, and tips for relocating will be presented by recognized experts in their fields. The Ideal Living Resort & Retirement Expo will make the process of enjoying your new retirement or choosing a second home something that is exciting, informative, a lot of fun.